You’re right that this is not a straightforward factual claim, obvious to anyone who seriously thinks about it, like some of the other statements. Rigorously defending this is more than what one could fit in 1000 words. The first thing to ask when considering reasons for action is: Who is performing the action for which the reason is being sought? It is the individual who is seeking the reason, who is also the one to act. This should give the first hint that the self is special, in some sense, in moral issues. So whose judgment is guiding the action? One’s own. Now human beings are living beings. Non-human living beings automatically act toward the goal of their own survival, the maintenance of their own life process, the maintenance of an ideal life pattern as the type of organism they are. They gather food, find shelter or sunlight, and resist attempts to cut their life process short of its natural conclusion. Man’s basic means of survival is his own reasoning mind. To survive, human beings need to make tools to hunt, make clothing in harsh conditions, build or find shelters, etc. all by thought. (Those individuals who learn from others must at least exert the mental effort to understand and apply the knowledge.) The more people exert the mental effort necessary to innovate and develop new technologies, the better life gets for them and those who think enough to understand and apply the technologies. Once you reach an industrial civilization, you see not only unprecedented human survival, but unprecedented human flourishing. So the claim that “there is no reason to act for the well-being of other conscious creatures, apart from how doing so redounds on one’s own well-being,” is, in light of the above, seen to be a challenge for someone to provide a reason for damaging or destroying his own happiness. That is, it is a challenge to provide a reason for acting to violate the entire basis of reasons for action that is written into one’s own nature as a living human being. Clearly, there can be no such reason for action with any causal “binding force” behind it, since any causal “binding force” to reasons depends on the fact that the action leads to man’s natural reward: happiness. First of all, what does “important” mean? It means “having a large effect on something.” But what “something” are we talking about? Important to what or whom? If I am the one taking action, I am trying to achieve my happiness and I am considering the importance of various people and things, then I should be considering their importance to me and my life process. It does not follow from “my life is the most important thing to me and my standard of importance for other things,” that “other people and animals are unimportant to me.” They are important to the extent that they can and/or do affect my life as a human being. As a human being, I have both physical and spiritual (psychological) requirements for a flourishing life. Other people can benefit me by being trading partners, friends, lovers, sources of inspiration, etc. Animals can be useful and can be companions. On this point, I recommend my comments on this blog post. I also recommend Tara Smith’s works, such as Viable Values and Ayn Rand’s Normative Ethics. I don’t think anything you said about humans is controversial, but it doesn’t seem to have anything to do with morality. How would someone arguing from your position respond to a moral error theorist? Morality consists of the broadest principles of human conduct, applicable to all freely chosen actions of all human beings. They are the principles that everyone, in just about all situations–not just some people in some situations, such as chemists in a laboratory–ought to be following, if they want to achieve life (and concomitant happiness) in the long term. This is what Ayn Rand, Leonard Peikoff, Tara Smith and other Objectivist scholars have brought out so clearly about morality. I don’t think a moral error theorist would disagree with any of that, except that they would not call the process you describe morality. What I have described is the actual basis in reality for the moral claims that people make, even if they don’t understand it or abide by it consistently. If error theorists don’t call that morality, [after an explanation of the above error,] then they’re engaging in an arbitrary redefinition of terms so as to throw the legitimate concept of “morality” out of the language. “So you currently know of no cars that exist?” you say. But even you hinted that what you describe is not what people think-they-mean when they make moral claims. All a moral error theorist does is attack what these people claim to mean. If you are saying their morality comes from some other source, moral error theorist agrees. But since there is a lot of debate in this area still, it is not a trivial argument. Yes, that seems compatible with the view you described above. Unless you are also claiming that that which is good for humans is objectively good, in which case, a moral error theorist would disagree with you as well. A moral error theorist believes moral claims are in error IF the moral claim refers to objective/universal entities. In your earlier reply, I understood that you were saying that those types of morals do not exist, and that morality is actually derived from what-is-good for humans. In that case, the moral error theorist and you would agree that objective moral claims are made in error. It’s hard for me to adequately respond because I’m not sure quite where you stand on this. See, this takes for granted exactly the error of error theorists that I’m referring to. It is the assumption that to say that a statement about morality (or anything else) is “objective,” means that there is some abstract object, physical entity, or simple property residing in external reality that corresponds to the statement. But relationships among entities and actions also exist in external reality, and it makes no sense to regard these relationships as objects or properties. Imagine a pole that is on your left from where you are standing. Is it “subjective” to say that the pole is on your left? No, it is a matter of objective fact that the pole is on your left. Because it is a physical situation, anyone can potentially observe that by direct perception. Yet there is no property of “leftness” inherent in the pole. The relationship between you and the pole is an objective fact of physical reality not dependent on anyone’s moods or feelings, but it is not an object or property out there. Saying that something is good is describing an objective relationship, just like saying that something is to someone’s left. I discuss the relational objectivity of values here: Values Are Relational, But Not Subjective. Again, I still don’t think you are saying anything which contradicts moral error theory. They could accept, for the sake of argument, that you are correct that there are things which are objectively good via their relationship to humans. But this would not commit a moral error theorist to a position of moral realism. Even if you establish that there is something X which is universally good for humans, how can you objectively justify the notion that “what is good for humans is good, period.”? Moral error theorists are perfectly at ease with the notion of (at least) near-universal “goods”. They will still deny that what is good FOR something is good in and of itself. So maybe you might say “yes, but that is all morality is, the error theorist is giving it a narrow definition which people do not hold.” But this can’t be true — there is a ton of literature which demonstrates that people mean -more- by morality than “what is often-or-always good for humans”. So, I mean, I’d be willing to acknowledge that morality is objective if all you are contending is that we can make “true” statements about what is or is not “good” for the human animal. That is not the definition of morality I hold, though. Well, can rocks participate in “The Form of the Good?” How are we to know whether they can or not? If morality is more than “what is often-or-always good for humans,” then why wouldn’t it apply to rocks? What about ants? I would say that in this case, we could say that certain things are good for ant colonies and others bad. But can we say that ants can be moral or immoral? What are our grounds for judging? Unless we recognize that “good and bad” as concepts depend on life and the relationships of other things to its promotion/destruction–unless we recognize that “moral good and bad,” as a subset of general “good and bad,” depends on living humans with the capacity for free and deliberate choice, we won’t have a concept of “good and bad” that is rationally definable and demonstrable. 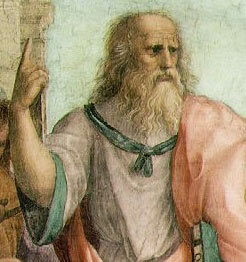 Since “moral good and bad” cannot be directly perceived by the senses, and cannot–according to the Platonic/Aristotelian realist–be dependent on observationally inferred relationships to human animals, such theorists are ultimately consigned to mystical “insights,” or subjective “intuitions” of alleged intrinsic values. Their arguments amount to rationalizations of their personal fantasies, emotional commitments and subjective predilections, rather than genuine inferences from objective facts. Why not? In holding a definition that recognizes a “moral good” unrelated to humans, you are simply accepting the Platonic error uncritically. When “moral error theorists” reject traditional “moral realism,” they are rejecting a mistaken position. But a theory is not properly defined by what it rejects; it is properly defined by what it accepts. And as far as I know, error theorists don’t accept the objective, relational view (Objectivist view) of moral truth that I have described. They have not replaced the mistaken view of moral truth with a correct view, but have simply rejected moral truths altogether. The original reddit conversation can be found here: http://www.reddit.com/r/philosophy/comments/213vdh/answering_sam_harriss_moral_landscape_challenge/cg9kmz8. I also recommend this related post: Ontology and The Problem of Universals: An Objectivist Comments and this book: Metaethics, Egoism, and Virtue: Studies in Ayn Rand’s Normative Theory. This entry was posted in Ethics and tagged Aristotle, Ayn Rand, books, error theory, life, nihilism, Objectivism, philosophy, Plato, Sam Harris, values by Sword of Apollo. Bookmark the permalink. I don’t think is right to describe morality as relationship. Morality is a code of values and concept of values originated from concept of life. This is a connection which moral error theory misses. Ultimatly one may say that whatever promotes living is objectively good for life. Life is the only objective standard of value and only thing which is good for itself. The only relations here are that which between a living organism and its own life. Objectively X is good because it promotes one’s life. There are no other objective standards. Now it’s easy to answer the question – is total disregard for other or animal cruelty promotes one’s pursuit of values? Of course not.